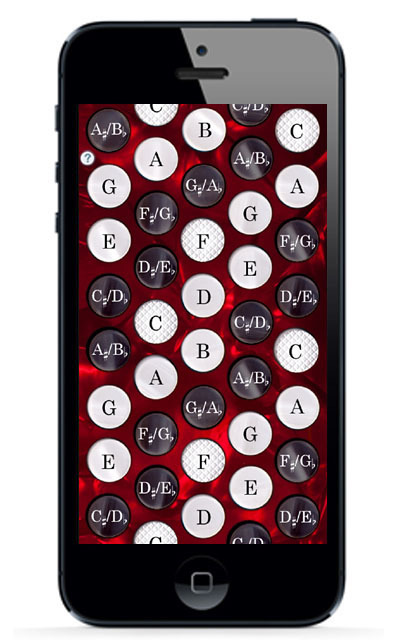 Using the built-in note guide, you will quickly learn the notes on the treble side of the C-System Chromatic Button Accordion and be playing songs in no time! The instrument has extremely high-quality individually sampled notes from a real instrument and a very fast, responsive button board for playing melodies and chords. For even more fun, plug your iPhone or iPod Touch into an external amplified speaker. Touch the "?" button to toggle the note names. Q: I'm not hearing any sound from the app, please help! Other programs are making sound! A: Please check that the mute switch on your iPhone is turned off. Even if other apps are making sound, my apps, which allow you to play along with music in your iTunes collection have to respect the setting of the iPhones's mute switch.